The first nonnative settlers arrived in Ragged Island, as Carbondale was then known, around 1802. Twenty years later, brothers William and Maurice Wurts were exploring the wilderness when they took note of several outcroppings of "curious black stones." These stones turned out to be anthracite coal, and the two Philadelphia businessmen became pioneers in America's Industrial Revolution. 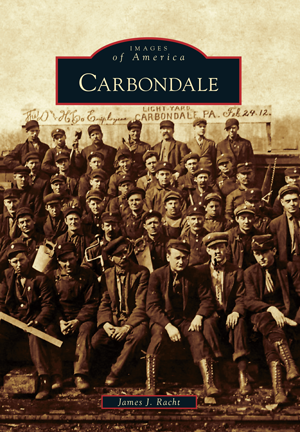 Carbondale's journey has taken many twists and turns during the past two centuries. The colorful and fascinating mosaic of images in Carbondale gives the reader a glimpse into the heart of small-town America and a clear picture of this historic city's past. James J. Racht, a local entrepreneur and lifelong resident of the Carbondale area, is a graduate of Sacred Heart High School and the University of Scranton. The Carbondale Historical Society and Museum has provided the vast majority of material for Carbondale and has worked tirelessly since 1975 to preserve and promote the rich heritage of the Carbondale area.